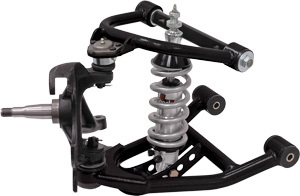 The gStreet line of front-suspension systems and components is an excellent choice for improving the performance and stance of many popular '50s through '80s GM passenger cars, with only minimal effort required for installation. System packages include tubular upper and lower control arms with bonded-rubber or poly bushings, depending upon vehicle application. Unlike competitor's coil-spring arms with crossbar mounts, gStreet lower control arms feature a true coil-over-style eye mount. To keep installation simple and maximize compatibility, control arms utilize the factory chassis mounts and bolt directly to stock or aftermarket dropped spindles. Arms feature a gray-hammertone powder-coat finish. CLICK HERE for related tech article.